Meet Tobi: Tobi is a 23-year-old from Ogun State. He is a banker and photographer who enjoys networking with people and playing football. His favourite food is plantain and eggs, whilst his favourite artiste is Davido. During his stay in the House, he will mostly miss his family and turning up. He will never be caught with a tongue piercing. A native from Ogun State, Oluwatobi Bakre is passionate about photography and football. Tobi’s hobbies range from poetry, dancing, rapping, singing and drawing. Against all odds, Tobi graduated from the University of Lagos considering he is an avid clubber who lives by his social media feed. 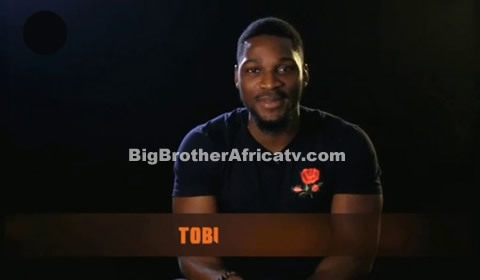 The youngest of four siblings, Tobi’s most painful experience was seeing his father cry at his grandmother’s funeral. Forever supportive, Tobi’s family shares in the Big Brother Naija excitement. He has always wanted to be in the House if only “for fun”.